Four years after making his assured album debut, a young north Londoner fulfils more of that depthless promise. FOUR YEARS AFTER his alarmingly mature debut, the intimate and self-revealing Home Again, Michael Kiwanuka, at the ripe old age of 28, musically swaggers back into the room with as confident a second statement as you could wish for, full of strong melodies, affecting lyrics, sharp playing, immense arrangements and sympathetic production. For a young man who writes and performs with such skill and apparent certainty and understanding, some of his protestations are a mite baffling. Of that acclaimed first album, Kiwanuka said in a recent press release, “I was just worried about everything,” and after it “I wanted to give up making music.” “I don’t know when I said that,” he admitted, a tad puzzled at the end of March, “but it was difficult making the second one... but I’ll always make music. I’m a bit hard on myself.” Well, with his persistence, attention to detail, and the help of new producers – Brian Burton (Danger Mouse), mostly, but also fellow Londoner Inflo and Home Again’s Paul Butler – Kiwanuka’s talent reasserts itself on a broader canvas through 10 compelling compositions that chart the life and thoughts of a young man growing up fast and in public, all expressed in ways anyone can empathise with. Rarely, in fact, have the universal anxieties – doubt, pain, guilt, disconnection – sounded so attractive. There is no easing into Love & Hate. The bold and ambitious 10-minute opening track, Cold Little Heart, is essentially structured as a five-minute overture followed by the song. Piano, shimmering strings and the word “cold” icily echoed set up a chilly theme before Kiwanuka’s guitar gently weeps into a solo that builds with an assured logic. At last, drums settle into a solid 4/4 and we find the song’s Cold Little Heart belongs not to a partner who’s discarded him, as would be the case in most love songs, but to Kiwanuka, whose contrition and pain knows no end: “Pleading, I’m pleading, my cold little heart / Oh I, I can’t stand myself” and “Did you ever notice, I’ve been ashamed all my life”, a mood mirrored by the sleeve’s image of a decaying heart. All sung, of course, in that believable, almost conversational warm, grainy tenor that in the past has drawn comparisons to Bill Withers, Richie Havens, Terry Callier and the Otis Redding of (Sitting On) The Dock Of The Bay. It’s a soul-folk, singer-songwriterly style that draws the listener close. A final guitar statement, gently weeping again, closes the track. Barely pausing for breath, lead single Black Man In A White World follows, and the subject matter of this muscular composition needs little elaboration. Against handclaps, kick drum and backing vocals, the lyrics have the directness of Gil Scott-Heron, as a synth echoes the strings of Marvin Gaye’s What’s Going On. The nub of Kiwanuka’s message is, It’s still going on, a notion hammered home by the backing vocals’ repetition of the title refrain. Reviewing Home Again, one of this writer’s few criticisms was of a preponderance of mid-tempo songs, and here the balance is much better. While Falling (“I don’t know why I stayed so long / I always knew you’d let me down”) builds to a huge choral ending that just cuts off, no fade, Place I Belong has a similar mid-tempo but kick drum and tom-toms give it extra grounding. What also makes Kiwanuka convincing here is a vocal style that sings long notes and holds them, with none of the ululation that too often now passes for ‘soul’. After the expansive choir and string arrangements of the opening five tracks, the funky 4/4 syncopations of the guitar-bass-drums that anchor One More Night bring an effective burst of straighter shooting, and while waiting for the guitar solo that never comes, the shortest track, the ballad I’ll Never Love, interrupts. A rumination on the loneliness that awaits him, this sad song will have them queueing up to give him a hug. He’s stricken with doubt again in Rule The World – “Help me to see / Who I can be... Take me out of myself again / Help me lose control... I can’t do this on my own.” After two minutes of questioning and disquiet, the track is lifted out of its slough by syncopating snare, hi-hat and kick drum that open the way for a choir and a Hendrix guitar solo to lead us to the end. A Scandi TV series theme-in-waiting, Father’s Child has a pretty tune, nicely sung – “I’ve been looking for miles and miles” – and lastly, coming full circle, spiky guitar phrases above thwacked snare lead into Final Frame: “You felt the pain of my foolish games...” A tremendously sad piece with the songwriter taking the blame for hurt and a relationship’s end – as in Cold Little Heart – synths swell in a fashion worthy of George Martin’s Eleanor Rigby arrangement until a guitar, at the last, proves as eloquent as Kiwanuka’s voice. Defiance, shame, uncertainty yet ultimately so positive thanks to his voice and warmth. 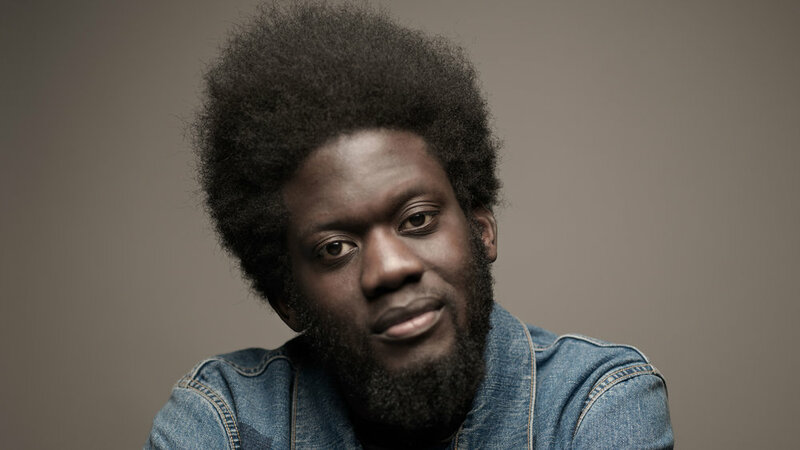 “I need something, give me something wonderful,” Michael Kiwanuka sings in Love And Hate. He’s indisputably given us something wonderful. And it works on-stage, too, as a late-March night at London’s Cadogan Hall revealed, when the artist and a five-piece band plus three backing singers played a 90-minute set, over an hour of which was new material, including Black Man... at syllable-squeezing breakneck speed. “Bit of a risk, I guess,” he said of earlier live dates, “but well received.” Expect likewise of the album.